WORLD WAR ONE | The International Cricket Hall of Fame. ‘Tibby’ Cotter was born on 3rd December 1883 in Sydney, Australia. A relatively short fast bowler measuring only 5’ 8” he is considered one of the first to have frequently used the bouncer against batsman. A student at Sydney Grammar School Cotter made his grade debut for Glebe aged only 15. He then made his debut for NSW in 1901 and for Australia on 26th March 1904 at the SCG v England. He then became a successful staple of the Australian team touring England in 1905 and 1909 and he also toured South Africa with the national team in 1910-11. 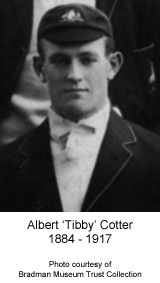 In 1912 Cotter was one of six leading Australian cricketers that refused to tour England for the triangular series due to contractual disputes with the Australian Cricket Board. With the interruption of WWI he would never play Test cricket again. In April 1915 he joined the AIF and his enlistment was used to promote others to join the war effort across the county. He served in latter part of the Gallipoli Campaign with the 1st Australian Light Horse Regiment before being transferred to the 12th Light Horse where he took part in the second Battle of Gaza. On 31st October 1917 Tibby Cotter was shot by a Turkish sniper as his regiment successfully captured Beersheba in Palestine. At the age of 33 Tibby Cotter was the only Australian Test Cricketer to die in WWI.